Loveland is the railroad station on the Colorado & Southern Railway near the mouth of Thompson Canyon, where the tourist destined for the Rocky Mountain National Park leaves the railroad and begins the stage journey. On leaving the railroad he travels for several miles between the orchards and through the meadows of the irrigated plain. Just east of the foothills the road traverses a short rock cut, in the sides of which may be found the petrified shells of extinct species of marine mollusks. These clamlike creatures flourished here during the Cretaceous period, when this region was under the sea. The foothills consist of a series of ridges separated by troughlike depressions lying in a general north and south direction along the mountain front. They were formed by erosion of the upturned strata. The sedimentary rocks of this region were formed in a nearly horizontal position, some of stream-laid deposits, others of sediments deposited in sea water. When the mountains were elevated these horizontal layers were bent upward, so that near the line of flexure they are steeply inclined toward the plains. Much of the uplifted part has been worn away by rain, frost, and stream. The soft layers were worn down more rapidly than the hard ones and valleys were formed where the softer strata outcrop. The harder layers were worn down more slowly, hence they outcrop in ridges. Thompson River has cut its way eastward through these ridges, thus forming an easy passage utilized by the road. The first prominent hogback or sharp ridge consists of Dakota sandstone.1 It is prominent because the sand is cemented together firmly to form a quartzite which strongly resists erosion. The Morrison formation described (p. 16) as containing fossil bones of huge dinosaurs outcrops in the brush-covered slope west of the Dakota hogback. Then in order westward are the several layers of red rocks of Carboniferous age (see table, p. 20). The upper part of these red beds, known as the Lykins formation, contains a bed of gypsum. 1This sandstone was named for Dakota city, Nebr. It is exposed in many places throughout the Rocky Mountain region and extends from New Mexico northward for 1,000 miles or more. It underlies the Great Plains and comes to the surface again in the Mississippi Valley many hundreds of miles east of the mountains. The pores of the rock are filled with water, which is reached by artesian wells in 11 states. In traveling up the canyon we pass a mill where cement plaster, a product resembling plaster of Paris, is manufactured from this gypsum. In the middle part of the red beds is a thick layer of hard cross-bedded light-red sandstone, known as the Lyons sandstone, which is described on page 41. A little farther to the west is a great series of still older red sedimentary rocks which lie on the crystallines of the mountains proper (Pl. X, p. 35). The geologist sees here in the contact of the red beds with the crystalline rocks the evidence of a long period of unrecorded time. The rocks at the base of the red beds are Carboniferous in age (see table, p. 20), while the crystallines on which they lie are older than Cambrian. This line of contact therefore represents four geologic periods and a length of time as great as that represented by all the sediments of the foothill region, or perhaps even greater. PLATE X. NARROW PLACES IN THE NARROWS OF THOMPSON CANYON. On the road between Loveland and Estes Park there are many places where there is scarcely room for the road between the river and the precipitous walls. The rocks of these walls were originally formed of sand laid down in horizontal layers. The sand consolidated and the layers were upturned to their present steeply inclined position when the mountains were elevated. 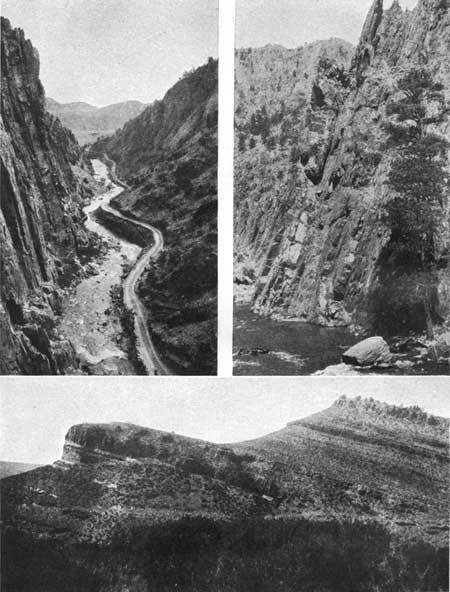 Upper left, Looking down the canyon toward the foothills and plains; upper right, Upturned layers of preCambrian quartzite; lower, Layers of red rocks in the foothills upturned against the mountains. Soon after reaching the crystalline rocks the canyon proper of Thompson River is entered. The first deep, narrow part of this canyon west of the foothills is known as The Narrows. It has been cut by the stream in a complex consisting of hard metamorphosed sedimentary rocks, into which were forced many dikes and irregular masses of igneous material which now appear as coarsely crystalline rocks of lighter color than the fine-grained sedimentaries. The strata are upturned steeply and in some places stand nearly vertical (see Pl. X, p. 35). Their attitude and physical characteristics give rise to the interesting features for which this canyon is justly famous. In cutting its passage the river has naturally sought the line of least resistance. When it strikes a layer of unusually hard rock it turns abruptly to one side, passes around the obstruction, and doubles back upon itself, following in some places an intricately winding course. The canyon walls are here characterized by sharp projecting edges of rock, and the top by pinnacles (see Pl. X), of varying form and height. In many places the walls rise sheer from the stream for hundreds of feet and are entirely wanting in vegetable growth. In other places trees have gained a precarious foothold by sending their roots into rock crevices, and we wonder how they survive. The bottom of the canyon is little wider than the stream, and in many places the roadway has been blasted from the cliff or is held up on the streamward side by a retaining wall. At the mouth of the canyon is a beautiful waterfall at the spill-way of the reservoir of the Loveland waterworks. Farther upstream the granitic rock which was forced into the sedimentary rock during ages long past is more abundant, and because it weathers more readily than the quartzite, the walls of the canyon here change from sheer precipices to craggy, forested slopes, and finally the canyon widens into an open mountain valley. Near the forks of the Thompson the rock is a coarse crystalline granite, much of which has the form known as pegmatite and consists chiefly of large crystals of pink feldspar, light-colored quartz, and crystals of mica, popularly, though erroneously, called isinglass. Crystals of this mineral may be found as large as one's hand and several inches thick, which can be split into thousands of thin transparent sheets. In this part of the canyon are many picturesque rapids (Pl. XI, where the water leaps and plunges from rock to rock and lashes itself into foam as if in impotent rage at the innumerable obstacles to its progress. Above the forks we enter the second narrow portion of Thompson Canyon, known as The Rapids and famous for unusual beauty. The canyon walls are steep and high, but the granite of which they are composed is variable in its resistance to erosion and weathers to an infinite variety of craggy forms that contrast strongly with the great barren faces which characterize The Narrows. Also the forest trees find more favorable conditions of growth here, and the pinnacled slopes (Pl. XI) are decorated in a variety of patterns in many shades of green on the somber background of the weathered granite. The bowlders along the stream are smooth and polished and are worn into a variety of forms by the never-ending friction in the bed of the stream. Where the channel is straight, grooves are cut into the rock, but where there are eddies in the current, circular depressions or "potholes" may be formed. One of these may be seen from the road near Linger Longer Lodge (Pl. XI). PLATE XI. SCENES IN THE RAPIDS OF THOMPSON CANYON ON THE ROAD BETWEEN LOVELAND AND ESTES PARK. Upper, A typical scene in the depths of the canyon, where the Thompson polishes the bowlders of granite and quartzite and grinds out the cobblestones. Middle left, One of the numerous pinnacles in the wall of Thompson Canyon. 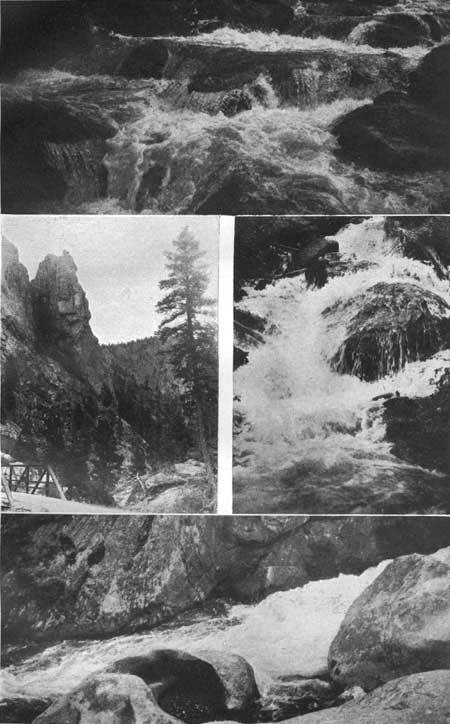 Middle right, Water versus rock. Where the river plunges and dashes itself into foam on its way to the plains. Lower, A "pothole" near Linger Longer Lodge, worn in a block of granite by sand and pebbles which are kept in motion by the eddying water. Probably the greatest admiration for this part of the canyon is aroused by the rapids. The canyon contains great numbers of granite bowlders worn smooth and round by the never-tiring current. Over and among them the water dashes and foams. Out of some dark brushy obscurity (Pl. XI) it leaps, flashes for an instant in sunlight as it breaks in spray against some rocky obstruction, gathers its shattered parts, and passes again into obscurity, only to repeat the ever-varying performance again and again on its eventful journey, until it emerges from the mountains and finds rest for a time in some of the numerous irrigation reservoirs on the plain. 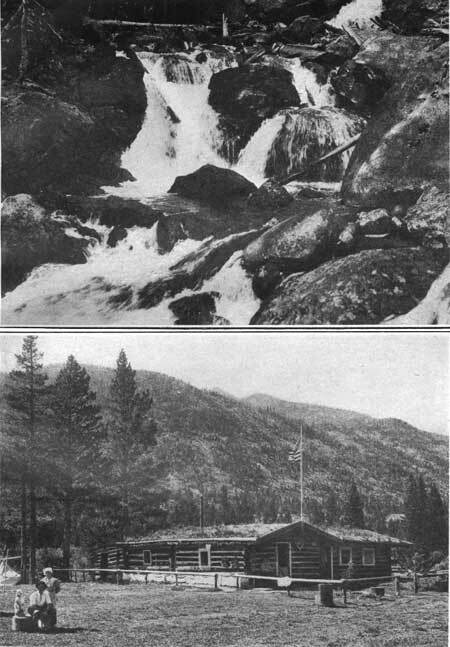 Like the tourist who leaves the humdrum existence of everyday life and enjoys a summer of unusual experience in the mountains, this water in its eternal round of change through vapor, rain, snow, and stream, has visited the park, has spent its vacation on the Snowy Range, and is now on its way back to less spectacular but more useful vocations. For this water will find its way through the intricate maze of irrigation ditches to the orchards and to the fields of alfalfa and sugar beets on the plains. There it will linger for a time and make the desert beautiful in blossom and rich in fruit. Lyons is the terminal of a branch of the Chicago, Burlington & Quincy Railroad, where the traveler destined for Estes Park by way of the Lyons route takes stage. Lyons is located in the foothills, in the midst of the sharp-crested ridges or "hogbacks," composed of upturned and eroded sedimentary rocks. The easternmost prominent "hogback" consists of the hard sandstone called Dakota. East of this ridge the rocks are chiefly shale which accumulated as mud in the ancient sea. Because this shale is soft and easily eroded it has been worn down to a nearly level plain, which contrasts strongly with the uneven surface in the foothills, where hard and soft layers of rock alternate. The troughlike depression just west of the Dakota "hogback" is due to erosion in tho soft rocks of the Morrison formation, named for the town of Morrison, situated about 40 miles south of Lyons. This formation contains the fossil bones of some of the most remarkable extinct animals that ever lived (see p. 17). West of this trough the ridges consist of red sandstone and shale. In their midst is a series of thick cross-bedded flaggy layers, known as the Lyons sandstone, named for the town of Lyons. This rock has been quarried extensively for buildings and has furnished many flagstones for the streets of Denver and other cities of Colorado. In the sandstone are preserved the footprints of some of the animals that roamed over this country long ages ago. The strata were formed during the life of the earliest known land animals; hence in the streets paved with these stones we literally follow in the footsteps of the first beings that walked on land. 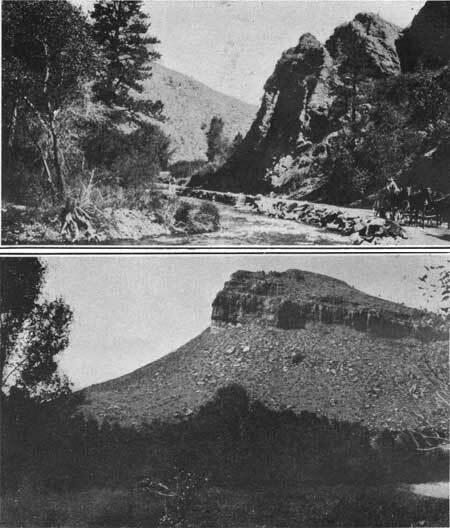 The parklike opening in which Lyons is situated was formed by St. Vrain River cutting a passage through the red rocks. After leaving the town we follow up the river between cliffs of the red strata. To the right may be seen quarries from which flagstones are obtained. At Steamboat Rock (Pl. XII, B, p. 45), which stands like a dominating headland overlooking the valley, we turn to the right through a trough cut by the river along the junction of the red beds and the underlying granite. The river cut along this junction because the rocks here are softer than those on either side. The granite near the contact with the overlying sedimentary rocks is coarsely crystalline and breaks down into coarse gravelly débris. Also the lower layers of the red rocks are soft and are easily worn away. After following this trough for about 2 miles we turn westward and plunge into the narrow canyon between walls of gray and pink granite. Some of the pink varieties are delicately colored and may some day be valuable as ornamental stone. Attention is divided between the rushing waters of the river on the one hand and the precipitous walls and wooded slopes on the other (Pl. XII, A, p. 45). On leaving the canyon we take a winding course through forested hills, which assume huge proportions as we approach Estes Park. Mount Pisgah (8,500 feet) and Mount Olympus (8,808 feet) appear at the right and Kruger Rock (9,342 feet) at the left. As we emerge from the hills which lie between these higher summits a splendid view is obtained of the group of commanding summits that culminate in Hagues Peak (13,562 feet). PLATE XII. A (top). THROUGH WOODED LANE BETWEEN RAPID AND CRAG. B (bottom). STEAMBOAT ROCK. A promontory of red sandstone west of Lyons overlooking the St. Vrain. VIEWS IN THE CANYON OF THE ST. VRAIN ON THE ROAD BETWEEN LYONS AND ESTES PARK. One of the approaches to the Rocky Mountain National Park is by way of Ward, a small mining town situated at the terminus of the railroad commonly known as the Switzerland Trail. Ward lies 9,269 feet above the sea and is near the top of the once nearly level surface called the Rocky Mountain peneplain (p. 16). Over this elevated surface, now trenched by the streams, the road winds northward to the canyon of the Middle St. Vrain. This canyon is cut to a depth of more than 500 feet below the general level of the ancient plain. The route leads eastward down this canyon, then northeastward up a branch canyon to Allens Park and the North Fork of the St. Vrain. Here we descend the lateral moraine of Wild Basin Glacier (see p. 34), cross the floor of the melting basin of this glacier, and climb the low ridge at the end of Copeland morainethe great elongated hill of bowlders and smaller fragments of rock deposited at the northern edge of the old glacier. Here we are fairly within the region of the Rocky Mountain National Park, and the route farther to the north is described elsewhere (pp. 71 et seq.). One of the interesting views obtained on this trip is that of Longs Peak and the mountains surrounding it. Here is seen one of those landscape curiosities which usually arouse interest. The crest of the ridge west of Longs Peak outlined against the sky resembles the profile of a human face. At the sky line is seen forehead, nose, and chin in form suggestive of the upturned face of an Indian. The eye is represented by a bank of perpetual snow. Because of this likeness the mountain is called Chiefs Head. 1This and following notes on Indian nomenclature are taken from a manuscript by Oliver W. Toll (see p. 11). Grand Lake is the western gateway to the Rocky Mountain National Park. It is situated in the valley of North Fork of Grand River and is the largest lake in the vicinity of the park. The valley of North Fork lies along the western margin of the park. From the heights to the east of this great valley may be obtained magnificent views of the towering peaks of the rugged Medicine Bow Mountains to the west of it (Pl. XXII, A, p. 54), which some prefer to call the Never-Summer Range, following the nomenclature of the Arapahoe Indians, who called them nichéebeeche-nokhu (Never-no summer). The floor of the valley is nearly fiat, is beautifully wooded in many places (Pl. III, B, p. 14), and ranges in width from about 2 miles near Grand Lake to half a mile or less farther north. From the nearly level floor of the valley the surface rises abruptly on both sides in steep, rocky slopes which merge into the great cliffs and cirques in the sides of the mountains. East of the valley the mountain slopes are heavily forested in most places below timber line, but the Medicine Bow Mountains are less generally timbered and are more attractive to those interested in the land forms produced by erosion at these high altitudes. As seen from the south up the great valley the slopes appear regular, but in them are numerous great gorges extending from the main valley to the crest of the mountains. These so break up the seeming regularity that when the slope is viewed from the side it appears to consist of an intricate maze of rugged peaks, serrate ridges, sharp spurs, and deep canyons. The gorges in the Medicine Bow Mountains are relatively short and steep, for the mountain crest is only 2 to 4 miles from the center of the valley and rises about 4,000 feet above its floor. Because of this steepness the rocks have been carved into a great variety of picturesque forms, and in the absence of continuous forests these forms may be seen to good advantage. They are especially conspicuous near the head of North Fork, where the top of the Medicine Bow Range consists of a short ragged crest which reaches a maximum altitude of nearly 13,000 feet. The gorges east of North Fork are longer and are eroded much deeper than those west of the valley. This is due to the greater distance of the valley from the high mountains, the crest of the range lying 3 to 10 miles east of the great valley and reaching altitudes of more than 14,000 feet. Originally these gorges were ordinary canyons or valleys formed by stream erosion. But during the Great Ice Age they were filled with ice which crept from the heights down the canyons to the great valley. They modified the canyons, which were V-shaped in profile, to the broad-floored valleys of U-shaped profile characteristic of glacial erosion. Also they scoured the bottoms and sides of the valleys, removing the partly decomposed rock and the loose débris. They broke off and carried away the projecting pinnacles and spurs of rock so that what may have been crooked, irregularly shaped valleys now appear as relatively straight or gently curved gorges with steep walls. Like the better known glacial gorges of the eastern slope, which will be described in greater detail, these contain numerous ice-smoothed surfaces of rock, glacial lakes, and beautiful waterfalls (Pl. XIII, A). PLATE XIII. A (top). CASCADE FALLS, ON NORTH INLET, ABOUT 4 MILES ABOVE GRAND LAKE. B (bottom). THE LODGE ON NORTH FORK OF GRAND RIVER, WEST OF MILNER PASS. Generally known as Squeaky Bob's place." SCENES IN THE VALLEY OF NORTH FORK OF GRAND RIVER.